Royal Caribbean announced today that the Broadway musical "Hairspray" will be the featured Broadway show on its newest cruise ship, Symphony of the Seas. Royal Caribbean made the announcement via Twitter. 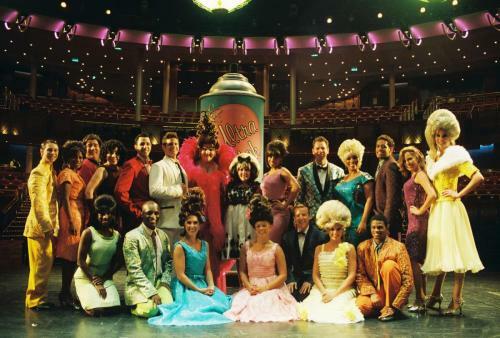 Hairspray originally played on Oasis of the Seas before being replaced by Cats in the fall of 2014. Symphony of the Seas will be Royal Caribbean's fourth Oasis Class cruise ship. It is under construction at the STX shipyard in France. The ship is scheduled to be delivered in 2018. Royal Caribbean International is the first cruise line to feature fully licensed, Tony Award-winning Broadway productions, and now the line is bringing Grease to Harmony of the Seas. Get a glimpse of the show's opening night and how it is thrilling audiences. Grease is one of the all-time classic Broadway musicals, and it is being shown to guests on Royal Caribbean's Harmony of the Seas. The Royal Theater is home to Grease, which marks the latest Broadway show to find a home on a Royal Caribbean ship. Grease was specially adapted by Royal Caribbean Productions, and boasts original choreography, costumes and aerial elements set to amaze the most seasoned theater goers. Featuring a soundtrack of crowd favorites such as “Summer Nights,” “Greased Lightnin’,” “Look at Me, I’m Sandra Dee,” “Born to Hand-Jive,” “Beauty School Dropout” and more, guests will follow the romantic twists and turns of Sandy and Danny as they navigate the tricky social waters of Rydell High School while keeping their reputations – and relationship – together. Get a backstage pass to Royal Caribbean’s exclusive performance of the hit musical, Grease. The cast are in final rehearsals and guests are in for some toe-tapping entertainment when the hand jive hits the stage onboard Harmony of the Seas. Royal Caribbean designed its newest cruise ship, Harmony of the Seas, to be an entertainment mecca that offers it all. The ship is also shaping up to be the premier cruise ship for Broadway fans all over. Royal Caribbean has had a strong relationship over the years with theater and Broadway, but Harmony of the Seas is taking it a whole new level. Broadway fans will appreciate these three aspects of the ship that offer the most Broadway connections of any Royal Caribbean ship to date. For nearly a decade, Royal Caribbean has been offering Broadway shows on its ships and Harmony of the Seas continues that tradition with Grease. The all-new, never-before-seen stage production, specially adapted by Royal Caribbean Productions, will boast a soundtrack of crowd favorites such as “Summer Nights,” “Greased Lightnin’,” “Look at Me, I’m Sandra Dee,” “Born to Hand-Jive,” “Beauty School Dropout” and more. Grease is an established Broadway show that has played on The Great White Way, and all over the world. Its songs are classics and the story has become so well-known that it transcends its stage roos. Harmony of the Seas will see Royal Caribbean venture out to create its own original production musical, which aims to be just as entertaining as anything on 42nd street. 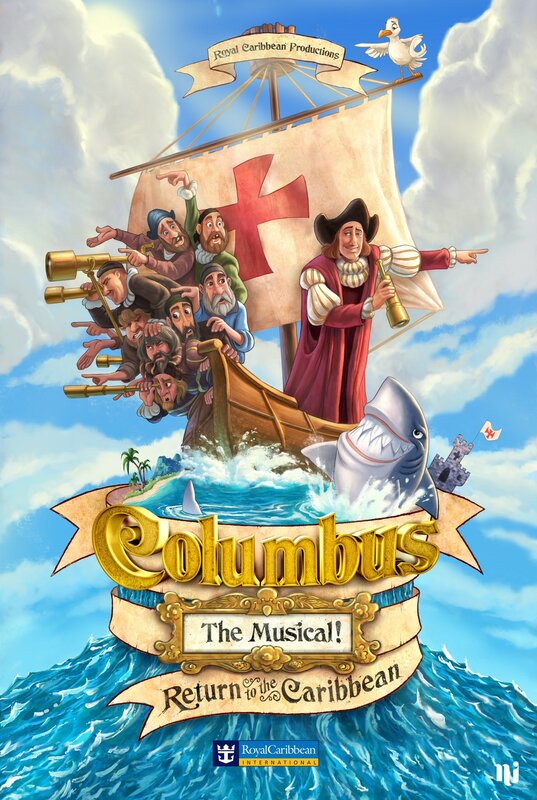 Columbus, The Musical! is a new Royal Caribbean original production that tells the tale of Christopher’s luckless distant cousin, Marvin, on a madcap voyage to the Caribbean. Royal Caribbean created the show in the spirit of “Spamalot” and “Something Rotten." With inspiration like those two shows, this new musical is headed in the right direction. Marvin Columbus is the very, very, very, very, very distant relative of Christopher and spent his entire life ‘neath Chris’ shadow. Marvin’s disappointed nobleman father, sends him on a voyage to find his destiny. Storms, pirates, and even flying sharks – all lead Marvin to his greatest discovery; himself. Romance, adventure, and ‘happy ever after’ are on the map, as Marvin Columbus finally finds his destiny. One of the funniest and heart-warming musicals of all time is Avenue Q, and its creator has created a brand new show just for Royal Caribbean. Tony award-nominated actors and imaginative producers John Tartaglia by and Michael Shawn Lewis of Gable Grove Productions created, Away We Go! just for Harmony of the Seas. This is a family show, that is meant to be seen by kids and their families. Away We Go! is aimed at 3- to 11-year olds and follows up Tartaglia's previous creation for Royal Caribbean, ImaginOcean. 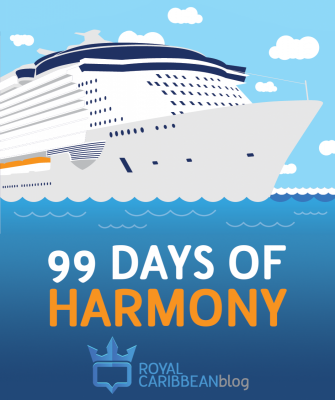 Royal Caribbean is counting down the days until its brand new Harmony of the Seas debuts and as of today, there are 99 days until that happens, so for the next 99 days we will be posting something every day about this amazing new ship. Ever since Royal Caribbean introduced Broadway shows to its cruise ships, guests have been clamoring for more and Harmony of the Seas will feature a brand new Broadway show that has proven to be a classic for years, Grease. The fact that tickets to Grease are complimentary is a big deal when you consider how much Broadway show tickets cost, even if the show is on tour off Broadway. Royal Caribbean has made a name for itself by offering Broadway shows on its cruise ships, including Cats on Oasis of the Seas, MAMMA MIA! on Allure of the Seas, Saturday Night Fever on Liberty of the Seas and now, Grease on Harmony of the Seas and Independence of the Seas. Stay tuned for tomorrow's post as we celebrate the 99 days of Harmony! For a few weeks now, Royal Caribbean Vice President of Entertainment, Nick Weir, has been teasing Royal Caribbean fans with hints at which Broadway show is coming to Harmony of the Seas. Royal Caribbean has not announced which Broadway show will be featured on its newest Oasis class vessel, but Weir has used Twitter as way to drum up excitement for the new ship and keep fans guessing. Whatever the show ends up being, it definitely sounds like guests can expect Royal Caribbean to offer a Broadway show onboard, which follows in the tradition of offering Tony-award winning Broadway shows on its newest ships. Royal Caribbean offers four other Broadway shows on its ships, including MAMMA MIA!, CATS, We Will Rock You and Saturday Night Fever. Royal Caribbean has a well-deserved reputation for offering its guests world-class entertainment and chief among the cruise line's offerings are the Broadway shows onboard. Select Royal Caribbean ships offer Tony Award-winning shows that are the exact show you would have seen on The Great White Way. Here is a breakdown of everything you need to know about the Broadway shows Royal Caribbean offers and what to expect. Back by popular demand, the hugely successful “Hairspray” – the brand’s first Broadway musical at sea – will return on Symphony with a total refresh to headline the Royal Theater. Hairspray is the classic Broadway musical set in 1962 that deals with racial integration, dancing and the advent of television. Hairspray is a fun show that tackles a serious issue . The show features some very famous songs that many will find themselves singing along to. Excellent lighting, choreography and staging really make this a show not to miss. Hit musical specially adapted by Royal Caribbean Productions, boasts a soundtrack of crowd favorites such as “Summer Nights,” “Greased Lightnin’,” “Look at Me, I’m Sandra Dee,” “Born to Hand-Jive,” “Beauty School Dropout” and more. Musical from London's West End that was written by legendary comedian and author Ben Elton. Show features a score of Queen songs such as Radio Ga Ga, I Want to Break Free, Bohemian Rhapsody and of course We Will Rock You. Based on T.S. Eliot's “Old Possum's Book of Practical Cats,” CATS was one of the longest running productions on Broadway and is the winner of numerous awards including seven Tonys, two Oliviers and a Grammy. Based on the hit music from ABBA, Mamma Mia! is the story of a girl getting married and wanting to meet her estranged father. Mamma Mia! played on Broadway for over 10 years. Go back to the 1970's with Tony Manero, the king of the disco dance floor. It's a great mix of classic music, platforms and polyester! There is no additional cost to see the Broadway shows on a Royal Caribbean cruise. Admission is included in guests' cruise fare. On Royal Caribbean ships that allow for entertainment reservations, guests may reserve tickets in advance for the Broadway shows. To reserve tickets, simply log into the My Cruises section of Royal Caribbean's website and then access the Cruise Planner section. Broadway shows will be listed under entertainment. Reservations for Broadway shows are usually not available until about 120 days in advance. You can absolutely still see one of the Broadway shows without tickets, you will simply need to show up in advance of show time. Being at the theater at least 20-30 minutes before show time should suffice. 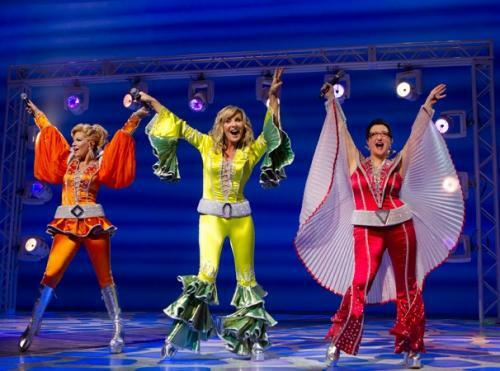 Which Broadway show are you most excited to see on a Royal Caribbean cruise? Tell us in the comments! Royal Caribbean brings another smash hit musical to guests - We Will Rock You! Written by British-comedian Ben Elton, this hilarious award-winning and record-breaking phenomenon is built around 24 of the greatest hits of British rock legend, Queen.